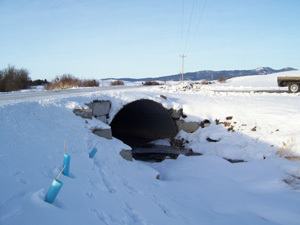 Located in the highway right-of-way adjacent to the University of Idaho Plant Science Farm and on the Elks Lodge #249 property, the restoration project included the removal of an old retaining wall located on the south bank upstream from the Mill Street crossing culvert and the stabilization of banks surrounding the culvert as it daylights downstream.The upstream concrete retaining wall is approximately 20 feet long by 10 feet deep by 9 inches thick. 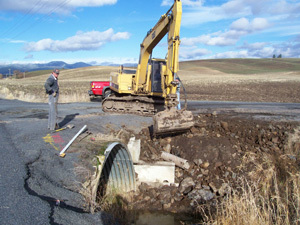 The concrete was removed and disposed of offsite by the North Latah County Highway District. Following the removal of the wall, the banks that average 7.5 feet high will be pulled back to a minimum 2:1 slope to help reduce sedimentation. An average 30-foot buffer was planted with woody and herbaceous plant species in order to increase shade and also help to filter sediment, toxins and nutrients from the adjacent fields and road. 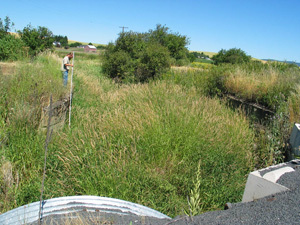 The South Fork of the Palouse River is approximately 25 feet wide with steep eroding banks. The retaining wall has caused a build up of sediment within the channel and is starting to lean inward threatening to topple. 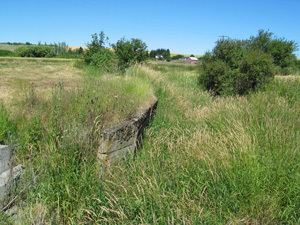 At the downstream section of the culvert, the sides are steep and eroding due to run off from Mill Road. 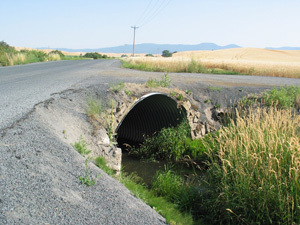 Before Treatment (August 2005): Upstream of the culvert before treatment. You can see old bridge supports on both banks that are caving in. The creek is choked with reed canary grass to the point where it is not even visible. 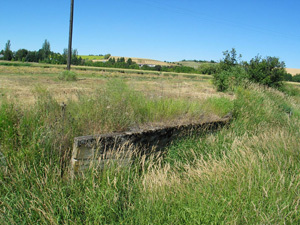 Pre-Treatment (August 2005): Old bridge support. 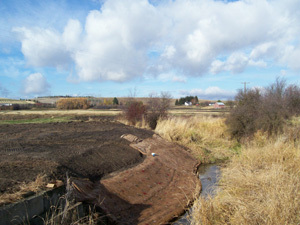 After Excavation and Stabilization (November 2005): Upstream from the culvert after treatment. 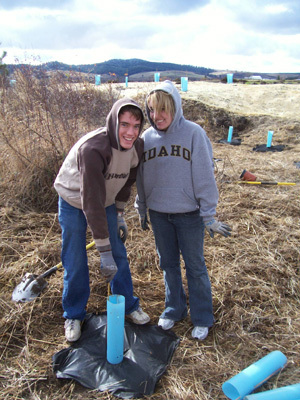 Blue Tube City (November 2005): This is the scene after a volunteer planting event. 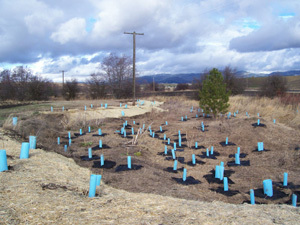 The blue tubes help protect the young plants and the black squares are weed matting that will help to suppress grass around the plants until they can grow above it. After the plants have established themselves we will remove these measures and re-use them on another project site. 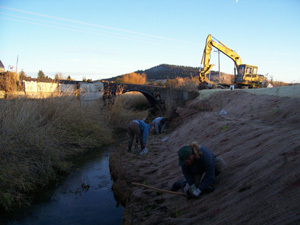 Photo Point B1 Downstream (November 2005): Planting rush and sedge plugs. Happy Volunteers! 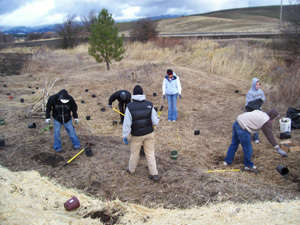 (November 2005): These volunteers are in good spirits as they plant native shrubs. Great job! 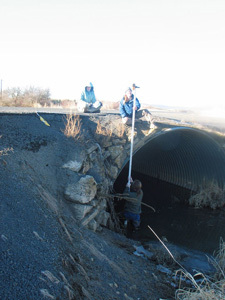 Photo Point B2 Downstream (February 2005): The watersheds team is seen here taking channel measurements on the downstream side of the culvert. 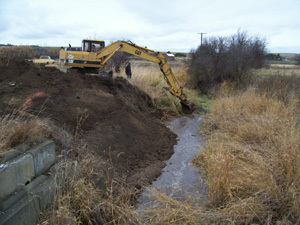 Excavation (November 2005): The bank here is being re-sloped after an old bridge support was removed. Biologs! 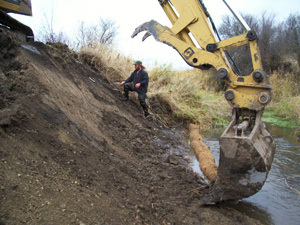 (November 2005): Ken Hobson places Biologs at the toe of the bank with the help of the excavator. These Biologs will help to hold back the bank and catch sediment runoff from the bank. It will also absorb and deflect water pressure as the stream rounds the bend preventing undercutting and erosion. Excavation (November 2005): Here they are excavating along side the culvert in order to install eco-blocks to retain the bank underneath Mill road.